ElbiDrop’s Supreme Keepall 45 raised $8375 in 24 hours for our charities! 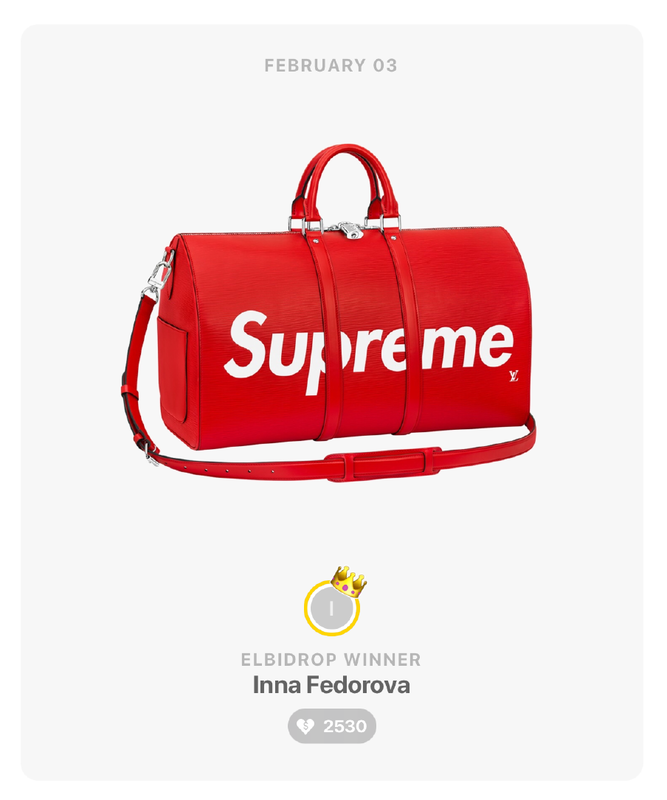 The top 30 drop contenders for ElbiDrop’s Supreme Keepall 45 raised $8375 for our charities! Inna Fedorova was the top donator in 24 hours and therefore was crowned winner of this exclusive item. ElbiDrop now introduces "gamification" to philanthropy, applying game-design and competition to encourage donations. ElbiDrop lets you win "exclusive" items from iconic brands, from Louis Vuitton to Messika. The person who collects the most Elbi LoveCoins in 24 hours, wins! Earn a Coin from every donation you make - on a charity video campaign, on other people’s “reactions”, and by creating “reaction” videos yourself to inspire others to donate. The challenge in ElbiDrop is to browse the app to find new video campaigns and reactions to watch and support, and to make reaction videos of your own. A push message starts the 24 hour ElbiDrop. A Leaderboard ranks those with the most LoveCoins. When the stopwatch runs out, the person with the most LoveCoins wins the item!